Most of my garden is vegetables and herbs, I have to admit. 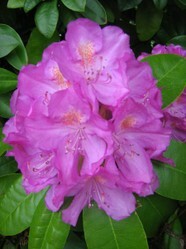 But there are some flower beds, and they are at their best in June, our early summer here on the West Coast of Canada. On the stairs to the back porch are containers with a mixture of spring bulbs and violas. While the bulbs have now finally finished after a long display, the violas are still determinedly flowering. Along the driveway, which follows the property line between us and our northern neighbors, we have a variety of mature shrubs which are on their property. Out by the road is a hazelnut tree mixed up with a japanese plum, a rhodo, and a japanese quince, all pretty in their time but the plum and quince are finished flowering before June starts. Then there are more rhodos, recovering slowly from being hack-pruned 2 years ago: they flowered quite well this June and are putting on lots of new growth, covering up the bare dead sticks. We planted a beauty bush and a small bush from Saskatchewan that we don't know what it is, at this end of the rhodo run. In front of the house is the main flower bed: the clumps of Siberian iris have spread nicely and are now in their glory, and they are joined by wild purple columbines, white dwarf astilbes, a fluffy silver artemisia, wild alpine strawberries with white fruits, and assorted odds and ends. Nelly Moser clematis: the best flower display yet, and the vine reached the top of the trellis later on! Iris growing in the bed directly in front of the house. It's dry, but they don't mind! Not as scented as the purple kind, but still beautiful. A spray of white lilac flowers. Also in flower, though not strictly speaking "flowers": peas of many kinds, kale which wintered over from last year, raspberries, (not showy, but the bees go crazy for them), the first few tomato blossoms, strawberries, and probably other things I've forgotten. Kale plants are amazing in flower. Even rather wimpy plants like ours throw up a flower stalk more than 6 ft tall and 2 ft across, with hundreds of flowers which the bees love. Then, seedpods develop from the bottom up, about 2-3" long and 1/8" across. Eventually these seedpods dry out and the seeds become black and fully mature. We plan to harvest the seeds from these plants, not to grow more plants (because we grew several varieties, plus sprouting broccoli, and they will have crossed in all directions), but a sprouting seed for our indoor sprout-growing on the windowsill in the winter. Peas have more variation in flower color than you might think. While the common shelling peas, snap peas and snow peas mostly have white flowers, the soup peas we grow to dry for the winter have beautiful pink/purple flowers. There are other varieties with other flower colors too, and did you know that there are pea varieties with colored pods, too - purple, yellow and even red! I'd love to grow some of those in future years.